Having some problems with your ignition and you are looking for a pro company to end them for you? 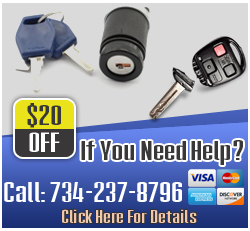 If so, then don’t look any further than Car Locksmith Canton MI. Our hall of fame locksmiths will end all of your problems so your ignitions will return to normal in a matter of minutes. The ignition is critical if you want to have a vehicle that operates correctly. Ignitions are what allow us to control the engine, and when they malfunction, you will definitely have a tough time starting up our automobile. Avoid this by calling onto our pros and receiving the best help possible. Trying to get your ignition key cut and created but you have no earthly idea where to go for this conundrum? If so, then leave it to us to get you out of your tough circumstance. When you’ve got our locksmiths around, you’ll always be able to get your keys replaced and made by one of our cutters. Is there a broken key in your ignition and now you are beginning to panic and go out of control? If so, just sit tight and wait for our guys to come over. Don’t try to be a hero and get it out yourself; our technicians will safely extract it so you won’t do any damage to your system. Are you simply sick and tired of your broken ignition and you would like to completely replace it for a new one? If so, then call us and we can point you in the direction of our replacement services. 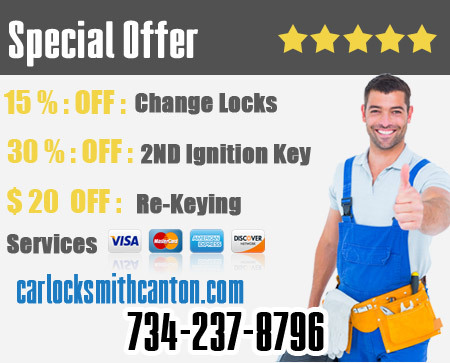 Car Locksmith Canton MI will remove your cylinder and get a brand new one in there without taking up a lot of your time. Zip Codes : 48188, 48187. Car Locksmith Service Location : Fleetwood Court, Celina Court, Millbrook Road, Paddington Road, Lonebridge Circle, Tannytown Road, Meadow Wood Drive, Shiloh Court, Highgate Court, Old Michigan Avenue, Oak Manor Court East, Country Club Lane, Preserve Circle East, Shepherd Lane, Country Drive, Randall Street, Porteridge Lane, Scenic, West Arbor Way Drive, Yorkville Drive, East Lakeview Lane, Cherry Grove Road, Calais Court, Brandywyne Road, Bridge Way, Glastonbury Drive, Victorian Square North, Pinecrest Drive, Arbor Way North, Glade Road, Glenmount Court, Rutherford Court, Meadowview Drive, Laurelwood Drive, Barkhill Road, Red Run Drive, Lone Wolf Lane, Gladstone Road, Stuart Drive, Highway 153, Grandover Court, Canterbury Drive, Hedgerow Court, Woodbridge Drive, Troon Lane, Gunnery Drive, Herbey Street, Richmond Road, Brookview Drive, Heathmore Court, Karli Lane, Swanmere Road, Highlands Drive, Bennington Court, Trent Court, Carriage Cove Apartment, Victorian Square East, Cleveland Way, Deer Pines Drive, Saxony Road, Glenhurst Drive, Commodore Circle, Stafford Court, North Spring Drive, Fredericksburg Street, Pittsford Street, Yost Road, River Way Drive, Wadebridge Drive, Prestbury Court, Tall Oak Lane, Cherry Hill Pointe Drive, Hartford Court, Tillotson Court, Lilley Road, Ridgefield Road, Ford Road, Creekside Court, Carriage Hills Drive, Boulden Court, Yarmouth Court, Regency Street, Lilley Pointe Drive, Goff Court, River Run Court, Fairway Circle, Coronet Avenue, Briarfield Street, Fairlawn Court, Orchard Drive, Terrace Court, Canton Rest Area, Pheasant Creek Drive, Sorel Drive, A Street, Steeple Chase Lane, Oxford Drive, Greenwood Drive, Circle East Boulevard, G Street, Wickfield Court, Ryegate Street, Lombardy Drive, Cheshire Lane, Page Street, Manhatten Circle, Mcdougal Court, Holly Drive, Fox Creek Drive, Cherry Orchard Road, Palace Avenue, Rolling Meadows Drive, Jan Circle, Plum Hollow, Inverness Road, Kirkway, Redwood, South Dr, Andover, Woodlong Drive, Oakbrook Court, Woodington Court, Ormskirk Drive, Beechwood Court, Woodbine Drive, Rector Drive, Maben Woods Lane, Twyckingham Lane, Argonne Court, Victorian Square South, Kings Mill Drive, Kennesaw Court, Lexington Circle South, Heron Circle, Greenleaf Street, Charrington Court, Doubletree Road, Gatehouse Court, North Corrine Street, Brookridge Drive, East Hickory, Radnor Road, Lynnwood Court, Marne Court, Rudgate Road, Sandhurst Street, Fort Henry Street, Knollwood Drive, Patriot Street, Commodore Lane, Fox Woods Drive, River Meadow Circle, Cameo Court, Haggerty Circle South, Stonebriar Drive, Chatham Court, Burlington Road, Applewood Road, Annapolis, C Street, Daleview Court, Glenullin Drive, Stonebridge Way, Claymore Court East, Haverford Drive, East Village Green Boulevard, Afton, Pheasant Woods Drive, Times Square Court, Timber Trace Blvd, Carriage Cove Circle, Fenwick Drive, Twining Street, Legacy Court, Alton Street, Stoneridge Boulevard, Woodwind Lane, Robyn Court, Lotzford Road, Guilford Drive, Union Valley Circle, Orchard Dr, Runnymeade Drive, Deer Creek Ct, Castleside Court, Quaker Hill Drive, North Dr, Vixen Court, Creston Court, Woodcreek Court, Chatterton Boulevard, Picadilly Court, Yates Court, Merrimac Road, Beechwood Dr, Comet Avenue, Hunters Way Court, Beech View Lane, Royal Villa Court, North Pointe Drive, North Canton Center Road, Peerce Court, Holiday Estates Mobile Home Park, Laurelwood Court, Sweet Cherry Lane, Pennefield Lane South, Scenic Circle South, Washington Way, Kings Way, Colling Drive, Hunters Ridge, Bostonhill Lane, Stoneybrooke Apartment, Stonehenge Drive, Larchmont Drive, Sunderland Drive, Fox Pointe, Hotspur Court, Devonshire Drive, Calloway Court, Oak Bridge Drive, Belmont Court, Mannington Road, Strawberry Court, Eriksson School, Round Table Drive East, Upland View Street, Vlge Green Boulevard East, Maple Park Drive West, Claymore Court West, Sevan Drive, Hastings, Redding Court, Monarch Avenue, B Street, Honeytree Boulevard, Northbrook Court, Vine Way Drive, Carlisle Court, Mistwood Court North, Amelia Court, Morningside Road, Walton Boulevard, Bishop Road, Trafford Court, Brookview Court, Cherry Ct, Norma Drive, Dennisport Drive, Horseshoe Circle, South Lotz Road, Metaline Drive, Chichester Road, Willow Creek Drive, Northwind Drive, Griffin Park East, Majestic Court, Steven Court, Emrick Drive, Ivybridge Way, Longwood Road, Fairborn Drive, Trails Court, Bunker Hill Lane, Hillsboro Court, Lexington Circle North, Trinity Road, Shana Street, Central Park, Doncaster Drive, Morton Taylor S Road, South Sheldon Road, Glenshire Drive, Stanton Court, Alexandria Ct, Shadowlawn Drive, Deepwood Street, Innsbrook Drive, Thistle Court, Balboa Road, Bobcat Court, Mott Road, Hanover Court, High Meadow Crossing Street, Heritage Drive, North Umberland Circle, Empire State Drive, Whitehurst Street, West Lakeview Lane, Dartmouth Court, Franciscian Court West, Autumn Ridge Apartment, Morrison Boulevard, Remington Court, Academy Drive, Briargate Court, Vistas Of Central Park Condos, Pavillon Road, Southwick Drive, Marshall, Emerson Drive, Stonebridge Way Court, Jennings Court, Saratoga Road, Siever Drive, Belvedere Court South, Wayside Drive, Nectar Drive, Rolling Green Court, Hopefield Court, Wild Turkey Lane, Ardennes Road, Fairfax Drive, Pickwick Drive, Cheviot Road, Thistle Drive, Bayberry Park Circle, Rosewood Court, East Annapolis Circle, Chatham Drive, Antique Road, Torrington Drive North, Brookmill Court, Mcintosh, Montfort Drive, Albany Drive, Chesterfield Drive South, Woodstock Street, Yarmouth Drive, Waterside Road, Canton Cmns, Arborway West Drive, Century Court, Sandalwood Road, Westbridge Drive, Middlebury Lane, Poppleton Boulevard, Kira Avenue, Bramble Court, Westgate Court, North Arbor Way Drive, Annandale Drive, Grand Oak Court, Kaiser Street, Willard Boulevard, East Spring Drive, Beech, Aylesbury Court, Ayrshire Drive, Ravensfield Drive, Newbury Court North, Bryn Mawr Road, Taylor Lane, Corbett Drive, Terrell Court, Creekview Drive, Camelia Court, Harbor Street, Woonsocket Street, Polo Drive, Edenbrooke Drive, Fleetgate, Canton Forest Condominiums, Blvd, Cranbury Court, Bridgewater Court, Scottsdale Drive, Brookdale Drive, Capri Drive, Nassau Court, Barchester Road, Hunters Circle West, New England Lane, Waterview Court, Foothill Drive, Corbin Drive, Iman Road, Eastham Drive, Southbridge Drive, Pleasant Ridge Drive, Morning Dove Court, Festival Court, Royal Pointe Drive, Tyler Lane, Geddes Road, Keystone, Inveraray Road, Knollwood Memorial Park, Fir Court, Post Mill Court, North Morton Taylor Road, Willamsburg Boulevard, Civic Center Boulevard, 5th Ave, Redfern Street, Buckley Court, Bay Harbor Lane, Woodham Court, Eastbridge Drive, Jackson Lane, Berkeley Avenue, West Hickory, Tradition Drive, Orchard Boulevard, Burr Ridge Court, Peters Drive, Bartlett Drive, Candlewood Court, Valley View Drive, Old Michigan Road, West Elm, Castleford Drive, Hunters Grove Boulevard, Cranmore Court, Vistas Court, Turnberry Drive, Delaford Court, Commerce Boulevard, Woodson Way, Martell Court, Wrenwood Lane, Kennebec, K Street, H Street, Chestnut, Embassy Drive, Ashton Woods Drive, Barclay Way, Fox Run Drive, Alleghany Street, Times Drive, Blythefield Lane, Willard Drive, Glencove Court, Carlton Road, Wyndchase Boulevard, Bradford, Burgundy, North Woods Boulevard, Bridge Court, Kensington Drive, Chalmette Court, Orhan Street, Shenandoah Circle, Nantucket Drive, Shoreview Drive, Silverwood Drive, Worthington Road, J Street, Potomac Lane, Simcoe Drive, Heron Court, Springfield Drive, Gold Arbor Street, Brittany Drive, Harvard Lane, South Annapolis Circle, Meadowlake Court, Emerald Pines Drive, Sutten Drive, Sylan Drive, Chelsea Road, Wakefield Drive, Wheaton Drive, Canterbury Circle, Charter House Drive, Cobra Court, Brookhill Lane South, Powderhorn Drive, Ashbury Drive, Woodster Court, Westfield Circle, Cavalier Court, Stafford Drive, Longfellow Drive, Penny Court, Central Park, Columbus Drive, Greenwich Lane, Thetford Court East, Hancock Street, Pilgrim Court, Danbury Drive, Cassia Court, Provincial Court, Ryegate Drive, Waddington Boulevard, Stanton Street South, North Haggerty Road, Woodgreen Court, Fern Court, Echo Forest Court, Heritage Park Road, Mornington Court, Fairfax Court, Hogan Way, Castleside Drive, Sheffield, Leeds Court, Wakefield Court, Ardsley Drive, Murray Hill Drive, Arborway North Drive, Canterbury Mews Cooperative, Courtland Drive, Muirfield Court, Scenic Circle North, Harriet Court, West Oak, Manhattan Circle, Lasalle Road, Cherbourg Street, Buckley Road, Stratford Drive, Hampshire Drive, Stonetree Drive, Potomac Road, Foothill Road, Congress Drive, Castle Court, West Village Green Boulevard, Circle West Boulevard, Kirkland Drive, Forest Bridge Drive, Lancelot Drive, Dionne Street, South Haggerty Road, Pinewood Court, Hidden Woods Drive, Brookstone Circle, Antietam Court, Chadwick Court, Hereford, Oakland Drive, Uptown Avenue, Parklawn Drive, Beechwood Drive, Lothrop, South Lilley Road, Hollywood Drive, Addison Avenue, Hystone Street, Peninsula Court, Quail Court, Newburyport Drive, Campbell Court, Moorgate Drive, Merion Drive, New Haven Way, Veterans Way, Premier Lane, Dominion Court, Newbury Court South, Crowndale Boulevard, Yorktown Street, Hawksburry Court, South Beck Road, Barr Road, London Court, Mclaine, Old Haggerty, Bancroft Court, Christopher Court, Aziz Drive, River Woods Drive North, Club Court, Canton Center Road, Masood Court, Abingdon Way, Castlegate Court, Providence Lane, Riverside Dr, Dogwood Court, Essex Lane, F Street, Virginia Court, Koppernick Road, Derby Street, Rector Road, Milcroft Court, Glenmount Road, Prospect Hill Street, Walnut Ridge Circle, Darwin Drive, Mcintosh Drive, Candace Lane, Burr Ridge Drive, Pocatello Drive, J St, Graystone Lane, East Lemont Court, Oakham Court, Timberline Drive, Village Way South, D Street, Meadowcreek Lane, Aberdeen Street, Brookhaven Road, Parkdale Drive, Glen Hollow Avenue, Fordham Circle, Connerwood Court, Shagbark Court, Winthrop Road, Chadwick Drive, Victorian Boulevard, Delaford Drive, Conner Creek Drive, Pineridge Court, Northampton Court, Argyle Court, Ranier Street, K St, Versailles Road, Elm, Wooster Street, Village Way, Schooner Drive, Weathersfield Way, Lilley Road, Franklin Drive West, Fieldstone Drive, Flushing Avenue, Great Falls Road, Chase Drive, Otter Pond Lane, Beech St, Riverwood Court, Adriana Court, Copeland Circle, Scenic Court, Jeffrey Circle, Queen Anne Drive, Willard Road South, Kings Mill Court, Locust Court, Brewster Lane, Coachman Court, Simsbury Street, Kristine Court, Greenwich Court, Hidden Court, Rand Road, Pelham Court, Woodsboro Court, Eddington Circle, Cedar Valley Drive, Centennial Drive, Lowell Avenue, Shepherd Court, Wellington Court, Morton Taylor Road North, Richmond Court, Thrush Avenue, Preserve, Claymore Drive, Buckingham Road, Barrie Drive, Maple Ct, Citadel Drive, Sylvan Drive, Bing Drive, Al Smith Street, Dundee Court, Woodbridge Court, Hunters Circle East, Hereford Court, Stoney Creek, Robyn Drive, Bath Drive, Cherry Stone Drive, Kings Court, Harsdale Drive, Singh Drive, Palisades Court, Cape Cod Way, Tamarack Drive, Keystone Avenue, Hunters Court, Federal Boulevard, Delancy Circle, Saratoga Circle, Lincolnshire Court, Iron Gate Road, Kimberly Drive, Oak Ct, Oak Manor Court West, Heron Way, Greenleaf Drive, Poplar, Provincial Road, Sherstone Court, Seabrook Drive, Sleepy Hollow Lane, Wareham, Hillary Drive, Honey Lane, Summit Parkway, Dunston Road, Ironwood Drive, Windbridge Boulevard, Windridge Boulevard, Artley Street, Marissa Court, Echo Woods Drive, Reisa Lane, Brookshire Drive, Sally Way, Edinburgh Street, School House Road, Clearsprings Court, South Canton Center Road, West Annapolis Circle, Leopold Street, Memorial Drive, I Street, Boniface Drive, Whittier Drive, Woodcreek Lane, Fairmount Park Lane, 5th Avenue, Prestbury Road, Arcadia Drive, Gordon Street, Rolling Ridge Court, Lancaster Court, Westminister Way, Abbey Woods, Huntsville Drive, Amanda Court, Rockefeller Drive, Westbourne Court, North Stonewood Road, Partridge Circle, Magnolia Court, Raminder Court, East Crystal Circle, Spruce Court, Anchorage Drive, Edmundton Street, Kirk Court, New Providence Way, Brookstone Dr, Douglas Drive, Baywood Boulevard, Belford Court, Spinning Wheel Drive, Ledgewood Drive, Westchester Lane, Oaktree Court, Lyndhurst Drive, Thornwood Street, Stonebrook Drive, Constitution Street, Stacy Drive, Paul Revere Lane, Mckinley Circle, Cherokee Circle, Mystic Court, Amber Court, Streamview Court, Ascot Road, Maple Park Drive East, Clampton Court, Patrick Drive, Clavey Court, Embassy Court, Camelia Drive, Abbey Circle, Scarlett Drive, Bridgemont Drive, Northgate Court, Bart Avenue, Queens Way, Dundee Drive, Crestmont Drive, Wagon Wheel Road, Glen Eagle Lane, Ivybridge Court, Amberwood Road, Brooke Park Drive, Saltz Court, Dominion Boulevard, Parkgate Court, Norm Walker, Franklin Square, Savannah Drive, Courtyard Lane, Durham Drive, Baron Drive, Tulip Drive, Royal Court North, Apple Court, Bayview Court, Samuel Court, Leeann, Winter Garden Court South, Old Bridge Court, Central Park Boulevard, Ironsides Court, Brookline Street, Oakleaf Court, Beacon Court, Centennial Court, Maplewood Drive, Ronda Drive, Pebble Creek Drive, Waddington Road, Lenox Drive, North Lilley Road, Charter House Court, North Drive, Ridge Road South, Creekwood, Wallingford Court, Crossbow Circle, East Elm, Lincolnshire Apartment, Fox Valley Drive, Founders Court, Bridgeview Lane, Stanton Court East, Worthington Court, Astoria Boulevard, Cinnamon Circle, Hyannis Court, Becky Court, Woodmont Drive East, Briarcliff Court, Coronation Road, Brookshire Court, Emerald, Gyde Road, Windmill Drive, Marsala Court, Fountain View Drive, Trotwood Court, Burr Ridge Circle, Candlewood Drive, South Cavalier Drive, Old Bridge Road, Hamlet Court, Foxridge Drive, Emily Court, Stuart Court, Fairway Club Apartment, Oakland Court, Wentworth Dr, Elmington Court, Colchester Court, Charrington Drive, West Lemont Court, Cardiff Avenue, English Court, North Cavalier Road, Mulberry Lane, Palisades Drive, Copper Creek Drive, Janice Drive, G St, West Oxford Lane, Valentine Court, Deer Creek Court, Wentworth Drive, Canton Court, Redfield Court, Lynn Street, Roundstone Court, Vistas Boulevard, River Meadow Boulevard, Poppleton, Warwick Circle, Preserve Circle West, Thetford Court West, Redcliff Drive, Franklin Drive East, Lansdowne Road, Piedmont, Gerald Court, Elmwood Circle, North Vistas Circle, Southgate Court, Larimore Lane, Cannelle Court, Village Green Boulevard West, Salem High School, Tradition Boulevard, Alexandria Court, Rutherford Ct, Farnum Drive, Gainsborough Drive, East Oak, Fox Path, Woodmont Drive West, Brunswick Drive, Meadowlake Road, Gold Ridge Lane, Creeks Bend Drive, Antietam Drive, Ambleside Lane, Courtview Drive, Whitman Avenue, Manton Boulevard, Wildrose Drive, Hanford Road, Grove Court, Franciscan Drive, Woodale Way, Radcliff Drive, Brookstone Drive, North Roosevelt Street, Dunhill Way Street, Craftsbury Court, Saltz Road, Williamsburg Boulevard, Oakmont Drive, Brookfield Road, Village Way North, Ramblewood Court, Tillotson Drive, Glengarry Boulevard, Westfield Court, Samantha Drive, Lancelot Court, Stonington Court, Madison, Liberty South, L Street, Liberty North, Princess Drive, Fairfield Court, Wiclif Court, Holmes Court, Admiralty Drive, Avium Lane, Nowland Court, Gloria Drive, Bannockburn Drive, Labana Circle, Somerset Square, Sandalwood Court, Labana Drive, Deer Creek Dr, Dorchester Circle, Orleans Court, Thornhill Road, Edington Circle, Lovewood Court, Kingsbridge Road, Broad Street, Weymouth Drive, East Oxford Court, Cather Street, Labana Court, John Drive, Lothrop Court, Brooklyn Court, Eddington Court, South Drive, Tottenham Court, Hadley Court, M Street, Glen Arbor Street, Nottinghill Lane, Liberty Street North, Black Horse Lane, Southgate Drive, Fernwood Road, Royal Court South, West Fern, Castle Drive, Pinecroft Drive, Timberline Court, Capital, Harsdale Court, 10 Point Drive, Oakview Drive, Sandpiper Street, Thames Court, Stanton, Rustic Ridge Road, Tremont Road, Woodwind Court, Graham Court, Sheldon Center Road, Old School, Helmsford Court, Chesterfield Drive East, Killarney Circle, Ashton Court, Ascot Street, Danbury Road, Kennesaw, Crowndale Lane, Wildwood Lane, Autumn Court, Fox Hills Road, Bramble, Finley Drive, Lowells Avenue, Addison Drive, Hartford Drive, Overhill Lane, Kennebec Court, Winter Garden Court North, Glengarry Woods Court, Selkirk Street, Lambeth Way, Blossom Drive, Franciscian Court East, Honeycomb Circle, Georgetown Street, Copper Creek Circle, North Ridge Road, Foxcreek Court, Hallcroft Drive, Argyle Circle, Paddock Lane, Scotia Court, Garfield Lane, Oakbrook Road, Forest Trail Drive, Brooklyn Drive, Cove Creek, Pepperwood Drive, Connaught Court, Maidstone Road, Leslie Lane, Tilbury Court, Raintree Drive, Jake Lane, Henley Drive, Antique Court, Citation Drive, Deer Creek Drive, Preserve Boulevard, Ardsley Court, Wales Street, Starlite Court, Haggerty Woods Court, Rustic Ridge Rd, Devon Lane, Forrest Drive, Elsa Court, Lillian Court, Green Meadow Lane, Vanderbilt Road, Warfield Street, Fairview Drive, Roseland Drive, Peachtree Court, Victorian Square West, Greenwich Circle, Pinehurst Drive, South Morton Taylor Road, Brighton Lane, Aarons Way, Regis Court, Epping Drive, Meadowbrook Drive, Tyndall Drive, Comet Court, Pond Run Court, Bruton Avenue, Fellows Creek Condominium, Mornington Road, Farmview Drive, Chateau Road, Windridge Lane, Woodmere Drive, Knightsbridge Road, Conner Creek Court, Scottsdale Court, Cumberland Drive, Foxthorn Road, Hemmingway Drive, Cedar Court, Glenhurst Court, Becky Drive, Middlebury Court, Michael Court, Verdun Court, Amsterdam Avenue, Market, Wyndchase Luxury Townhomes, E Street, Sylvania Lane, West Crystal Circle, Trent Drive, Briargate Drive, Lipka Court, Taft Lane, East Fern, Geri Drive, South Umberland Circle, Cherrylawn Court, South Vistas Circle, Beacon Court North, May Apple Court, Summit Creek Apartment, Champlain Court, White Tail Lane, Hillsboro Drive, New Boston Way, North Willard Road, Registry Drive, Poppleton Court, Hendrie, Windemere, Norwich Drive, Rivers Woods Drive, Northgate Drive, Hawksburry Road, Sarah Ann Drive, Coronation Court, Columbia Circle, Putney Court, Willow Street, Wadebridge Court, Lemont Road, Collingham Court, Marine Drive, Denton Road, Cherry Court, Burton Drive, Woodbrook Street, Atherstone Drive, Creeks Bend, Ashbourne Drive, Sturbridge Lane, Suffolk Court, Turnberry Court, Times Square Boulevard, Village Green Boulevard West, Forestview, Morningside Court, Woodward Road, Holbrooke Drive, Sherwood Circle, Round Table Drive West, Tudor Court, Carriage Cove Drive, Heritage Court, Strathmore Lane, Southwind Drive, Coventry Way, Heatherlea Court, Sunlight Street, Bellingham Street, Proctor Road, Hickory, Edgewood Court, River Woods Drive, High-ridge Drive, Arlington Road, Indian Creek Drive, Roanoke Avenue, Ravenwood Street, Drexel Road, Fieldview Drive, Edgewood Road, Belvedere Court North, Charterhouse Drive, Kingsley Drive, Ashford Drive South, Crestview Drive, Londonderry Court, Burnham Drive, Haverhill Lane, Tiffany Road, Chichester Court, Newgate Court, Arbor Way West, Hendrie Court, Holmes Drive, Torrington Drive West, Tiffany Circle, Fellows Creek Boulevard, Lanhan Court, Manor Boulevard, Harrow Court, Cedar, Belfair Court, Elizabeth Avenue, Wentworth Court, Foxcreek Drive, Cranbrook Road, Pembroke Drive, Killarney Court, South Lambeth Court, Newton Street, Chase Court, Fair Oaks Drive, Parkway Court, Swanmere Drive, Crosswick, Lyme Court, Baychester Boulevard, Newton Road, Hudson Drive, Brampton Drive, Park Lane Court, Epping Court, Lotus Drive, Hathaway Road, Gordon Avenue, Wooster Court, Appomattox Court, North Annapolis Circle, Creeks Bend Court, Botsford Court, Edmunton Street, Townsend Court, North Pointe Court, Leigh Court, Legacy Road, Lathum Drive, Hawks Nest Court, Bart Street, Maben Road, Winfield Road, Almaden Court, Rector Court, North Lotz Road, Delancy Court, Bircklan Drive, Timber Trace Boulevard, Arbor Way Court, Morton Taylor N Road, Foxcreek Boulevard, Clover Road, Morgan Drive, Madison Court, Robert Court, Savery Drive, White Hart, Cranford Avenue.